Fish trap on Holy Island? I’ve spent a lot of time visiting Holy Island – Lindisfarne over recent years, and every time I come I discover something new. Over the weekend I was up leading a conference fieldtrip, and after the tour was over I went down to the little beach below the parish church on the west side of the island, overlooked by St Cuthbert’s Island. I’d originally planned to pick up some seaglass (top tip – it’s a fantastic place for seaglass!). However, whilst gazing wistfully out to sea, I noticed that one of the ridges of what I assumed was a natural rocky outcrop on the shore looked very straight and relatively coherent. Once I’d got my eye in, it was distinctive enough that I thought it merited a closer exploration. I walked out and had a good look (see pictures) and I’m pretty convinced that this is not a natural feature and has clearly been deliberately constructed. As you can see from the images – the stones are not part of a natural outcrop of rock but comprises a series of larger squarish blocks of stone with a crude infill of a smaller rubble fragments. The coherency of the structure is not as clear as it appeared from the shoreline, but the larger blocks appear to form a distinctive feature with the rubble more spread around by the action of the sea. This side of the island faces onto the mainland so is not exposed to the full force of the North Sea and I’ve rarely seen large waves here, which seems to have preserved this structure fairly well. 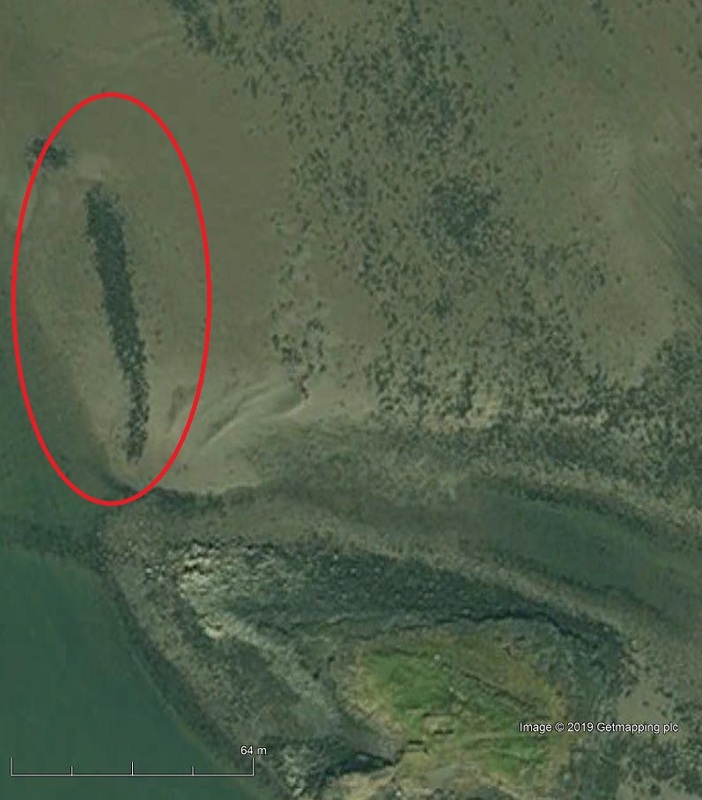 Overall, based on a quick measurement from Google Earth, the structure seems to b about 70m long, running roughly parallel to the shore (N-S) from a point about 65m from St Cuthbert’s Island. The classic shape for a fish trap is a simple V-shape, which would allow the tide flow to draw fish into the point of the V where they could be collected. The structure I have found does not conform to this – it is a simple straight stone bank. In many ways this is reminiscent of the stone feature known as the ‘Black Dyke’ that lies in Budle Bay, but other parallels can be found e.g. the stone fishtrap at Balleghan in Lough Swilley (Co. Donegal, Ireland) (Montgomery, Paul. (2015). Intertidal Fish Traps from Ireland: Some Recent Discoveries in Lough Swilly, Co. Donegal. Journal of Maritime Archaeology. 10. 117-139). The publication of the Balleeghan example suggests that this was originally a V-shaped trap with only one arm surviving which is a possibility in this case. 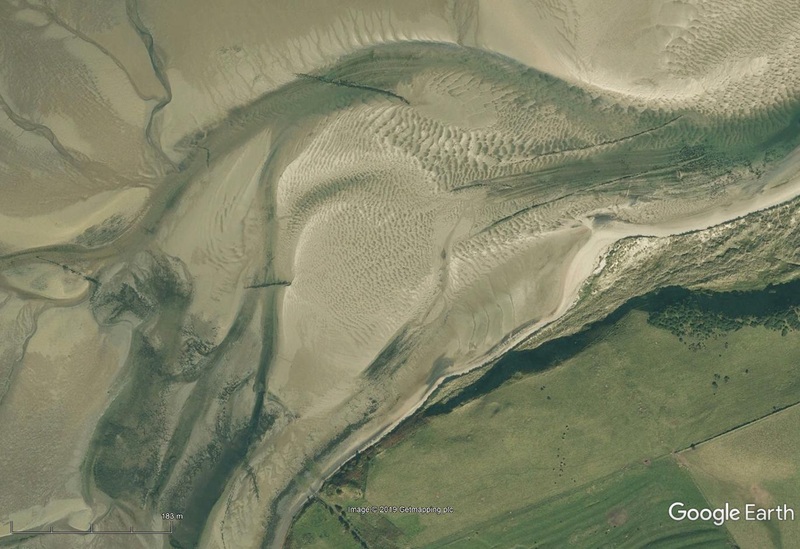 The examples from Budle Bay show a mix of V-shaped traps and simple banks/barriers. It is not easy to date this structure- some of the work on Irish fishtraps suggests that generally wooden fish traps might be earlier (prehistoric/early medieval) with stone fish traps coming in later (medieval/post-medieval), although it is unclear how firmly this applies to the Irish examples and how far the Irish chronology can be applied to English material. It is noticeable though, that as far as I can ascertain there are no documentary references to the Budle Bay or putative Holy Island fish traps – including in the account rolls from the medieval Holy Island Priory. There is a place name on Holy Island – “The Yares” (a local dialect term for fish trap) which belongs to an area of the sea lying between Castle Point and the sandbank known as Long Batt, but this seems to be too far south to relate to the structure I’ve found; there is also a place name “The Cages” just to the south of Beal on the mainland, more or less opposite Holy Island village, but again too far away to be related to the new structure. Overall, it is clear that fish traps were used in this area – not surprising given the tidal range and large open sand flats – however, we know precious little about their functioning or their date. I’d hazard a guess that these Northumberland examples are broadly medieval – the lack of any documentary trail suggests they are probably not later. However, it is quite possible that they are of an earlier (early medieval?) date. The key job now is to (a) record this example properly (b) have a think about how such a stone structure might be dated. Today I stumbled a nice example of the intersection of landscape and archaeology and folk tradition. We visited Nun Monkton, a village a few miles to the north-west of York. It’s a classic medieval village, with the houses arranged around the broad open green, with the church at one end. The green is dominated by a huge maypole that stands over 80’ high at the west end of the green. Maypoles are not an uncommon site in English villages, but this one is a whopper and believed to be the tallest one in England. Maypoles tend to sit at the ‘twee-er’ end of the folkloric spectrum, and tend to evoke images of Edwardian school children dancing with ribbons attached to the top of the pole. However, this kind of distinctive ribbon dance was an introduction from the Continent in the later 19th century. More traditionally, maypoles were focus for seasonal festivities, but often of a more ribald and boozy type, although they were commonly associated with music and dance. They were often dressed or adorned with greenery and boughs, not surprising with a monument so clearly associated with the beginning of May. As with many maypoles in England, the actual pole itself is not that old- the current maypole only dates to 2004, but its predecessor was erected in 1875, having been shortened in 1975 and the 1920s. Before, this a painting shows a pole in place in the 1840s and there are traditions that it stood there since at least the 1790s. The local village history has lots of information about the festivities around the 1875 erection which involved eight local vicars, a May queen, two river steamers from York and a brass band. As so often with this kind of landmark, it was a focus for hi-jinks with the front gate of the local pub being found on top of it after Mischief Night 1953. However, it is the earlier history of the location that turns out to be particularly interesting. First, adjacent to the maypole is the sorry-looking remains of a medieval stone cross. It’s not in great condition and little survives but the base. The juxtaposition of the cross and the maypole is certainly significant. Yet, the real interest is a report on a tradition that took place in the village recorded in that stalwart record of folk traditions Notes and Queries (4th April 1868, 361-2). It describes a tradition known locally as ‘Rising Peter’, which took place on June 29th each year (St Peter’s Day). According to N&Q, on the Saturday before the feast day the villages accompanied by fiddlers and players processed to where the maypole stood. A sycamore tree stood next to it, beneath was buried an rough wooden effigy or statue of St Peter in a wooden coffin (and apparently sometimes dressed in ridiculous clothes) – it was then processed to the nearby pub where it was shown publicly until the first Saturday after the feast where it was taken back to the tree and reburied until the following year. The whole process and the intervening feat period seem to have been associated with the feasting. The report notes that the tradition had died out by the time the note had been written (1860s) but had only become moribund in late years. Suggesting that it had been a practice that had survived at least into the early 19th century. Significantly, this means that it must have been at least partly contemporary to the use of the same site for the maypole. The curious coincidence of the maypole, the cross and the site of ‘burying Peter’ clearly marked a point of some ritual and customary significance to the local community. Importantly, its position on the village green meant that it was located on common land, and not private property. Often rites and ceremonies related to the affirmation of shared ownership and defining the boundaries of common land focused on processing around the edge of a territory – such as occurred at ‘beating of the bounds’ processions that often took place on rogation days. In this case, the green was a tract of common land over which villages had customary rights of access and use was situated at the heart of the settlement, but a similar kind of processionary tradition seems to have taken place. 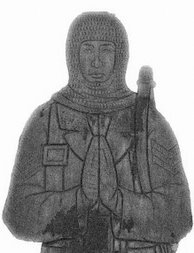 Although impossible to date the origin of this tradition, a medieval origin would not be unlikely and the dramatic reconstruction of the ‘death’ and resurrection of a holy statue has clearly parallels to aspects of pre-Reformation dramatic liturgical practice. Although the origin of the maypole may not be quite so early, the spatial link is clear and also there seem to be a temporal connection – the maypole seems to have been danced around not just at May but also on St Peter’s day, and the re-erection of the pole in the 1870s took place on and around this day. A final interesting note, and something that I only noticed on leaving the parish church, is that the maypole and crossbase lie exactly on the same west-east alignment of the parish church. As you come out of the church door, they are directly in front of you, although a couple of hundred yards away. This can’t be coincidental, and implies some kind of spatial connection between the church and this secondary focus of more ad hoc votive activity. Today Issy (no 1 Daughter) and myself did a little experiment in historical baking. We've been doing some Christmas cooking, but as we had all the spices out we thought we'd try the Soul Cake Technical Challenge. Soul Cakes were small spiced buns traditionally baked to celebrate All Souls Day (Nov 2nd), a feast in the Christian calendar which was also often accompanied by popular dramatic performances, such as forms of mumming and similar forms of folk theatricals. 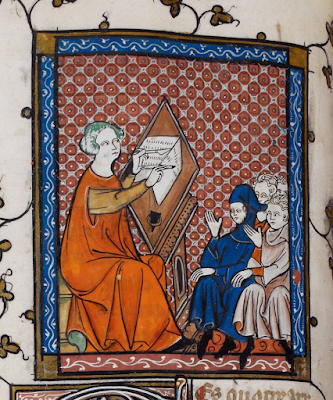 The Records of Early English Drama (North-East) is a project based at Durham University carrying out a major research project into all forms of early drama, including performances related to All Souls Day. On their blog they've been sharing a lot of information about Souling traditions, and as part of this have been encouraging people to try their hand at making Soul Cakes using an early 17th century receipt. The challenge being that early recipes were often pretty minimalist, and rarely include such minor details as quantities or cooking times. The recipe that was given was one taken from the household book of Lady Elinor Fettiplace (c1570-c1647). She lived for much of her life at Appleton (which although the blog says is in Oxfordshire, is actually in Occupied North Berkshire). The actual recipe is as follows:Take flower & sugar & nutmeg & cloves & mace & sweet butter & sack & a little ale barm, beat your spice & put in your butter & your sack, cold, then work it well all together & make it in little cakes & so bake them, if you will you may put in some saffron into them or fruit. It is mostly self-evident, although sack was a dry white wine (similar to sherry) and ale barm is the yeast from brewing beer. We tried to follow it as close as possible, the only differences from the receipt used by Lady Fettiplace was that we had no ale barm, only instant yeast, and we had no nutmeg. For the sack we used some sherry (good splash); the flour was white plain flour, the sugar was white caster sugar. We based our proportions on a soul cake recipe we found on-line, but because this also contained eggs and the ale barm would have also been liquid(ish), we found our initial mix rather stiff, so we loosened it with a little bit of milk. We ended up with something more like a bread dough rather than a cake batter. We left this in a warm place to rise for about 90 minutes. We decorated them with some currents in the shape of a cross and baked them for about 30 minutes at Gas Mark 5. End result, something that resembled slightly dense hot-cross buns. You could taste the spices, but the sack (sherry) didn't bring much to the party to be honest. I think we could probably have used a bit more yeast to make them rise a bit better, but otherwise, not bad at all. Now feeling inspired to investigate the Fettiplace book for more North Berkshire Jacobean recipes. Also might give the some of the online recipes for Soul Cakes although I imagine that as these contain egg, that they will be more 'cakey' than the sweet bread buns we made today. It also struck me as interesting as for a variety of reasons I’ve recently been reading a lot about the archaeology and anthropology of Oceania – particularly some interesting work by Nicholas Thomas, as well as Kirch’s On the Road of the Winds, and some stuff by the Tongan writer and anthropologist Epeli Hau’ofa. It reminded me quite how much archaeologists have used ideas ultimately derived from Oceanic contexts – the notion of prestige good exchange being an obvious example which has its origins in anthropological explorations of processes such as Trobriand kula rings. 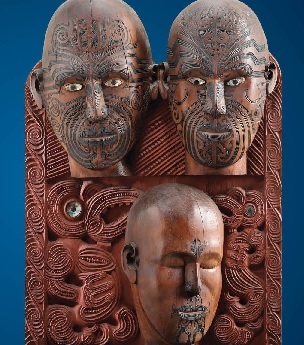 When I was an undergraduate, social evolutionary models looking at the development of chiefdom were popular amongst those working on Iron Age archaeology – much of it derived from anthropological and archaeological word carried out by scholars such as Timothy Earle on the more ranked societies that belong to eastern Polynesia (Tonga, Hawaii etc). Interestingly there also seems to be a little outbreak of, if not Melanesification, at least Polynesification, in Viking studies. Both Mads Ravn and Neil Price have made a case for using Oceanic parallels to contextualise Viking society. In some senses there are some obvious connections, seafaring, ranked societies with evidence for tran-oceanic expansion driven by something beyond simple population expansion. In my own reading I’ve found it really interesting taking some of these ideas that have permeated the archaeological literature back to their origin. In most cases it’s clear that the complexity and contingency of things like kula rings get stripped out when the model is transported. Also often, I’m not sure that anthropological parallels are always particularly illuminating when they are reduced to the banal level of ‘ooh look Pacific society exchange systems can be both reciprocal and hierarchical, a bit like Iron Age Britain’. I’ve my found my reading more useful in opening up possibilities rather than providing exact parallels, and also as a useful reminder of the sheer bloody messiness of non-state societies. They can be inconsistent, inchoate and are constantly dynamic. Indeed, it’s this complexity that so often gets lost when analogies are used to used uncritically – and as Matthew Spriggs has pointed out this kind of approach can strip out chronological change and contingency resulting in a kind of denial of history imposed on Oceanic societies. Ironically juicy anthropological parallels end up treated like Prestige Goods, handed around between peers and gaining their importance on the basis of their exotic provenance. Anyway next week I’m off to London next week to go the British Library Anglo-Saxons: Kingdoms, Art and War exhibition and the Oceania exhibition at the Royal Academy; I look forward to seeing how a really good understanding of emerging social ranking in Toga can only be developed by drawing parallels with 7th century Mercia. Fahlander, F. 2018. Oliver J.T. Harris and Craig Cipolla. Archaeological Theory in the New Millennium: Introducing Current Perspectives (Abingdon: Routledge, 2017, 238 pp., 32 figs, pbk, ISBN 978-1-138-88871-5). European Journal of Archaeology, 21(4), 640-643. Ravn, M., 2011. Ethnographic analogy from the Pacific: just as analogical as any other analogy. World Archaeology, 43/ 4, 716–725. Spriggs, M., 2016. Lapita and the Linearbandkeramik: what can a comparative approach tell us about either? In: L. Amkreutz, et al., eds. Something out of the ordinary? Interpreting diversity in the Early Neolithic Linearbandkeramik and beyond. Cambridge: Cambridge Scholars, 481–504. Last weekend I went to the Remembrance Sunday memorial events in the centre of York, marking the 100th anniversary of the Armistice at the end of World War I. As it was such a key anniversary, there were hundreds, probably thousands of people attending an event that is usually more subdued. I’ve blogged previously about some of my personal emotions about Remembrance Sunday, but I want to hear just briefly reflect on the physical experience of attending a large community ritual event – a little light autoethnography if you will. My first observation was the capacity for sound to cause affect (in the psychological sense of the word i.e. provoking or causing an emotional response). Obviously, at an event such as this there was music- a military band marching at the head of the parade leading to the memorial gardens and the playing of the Last Post. However, it was the two-minute silence that really struck me as an incredibly potent element of the ceremony. I found the silence of a large crowd in the middle of a large city quite remarkable – indeed, a little unnatural. In particular, it was noticeable how the need for silence changes the physical dynamic of the crowd. The end of conversation means that the people stop interacting with each other – although one or two couples stood close to each other and some parents held children, on the whole there was a noticeable ‘atomisation’ of the crowd. The combination of lack of noise and lack of other forms of interaction resulted in a really peculiar tension between being in a group and being an individual. The marking of this odd liminal period was also signalled by noise, in this case the firing of a pair of field guns. Having done a little research the 2 minute silence had its origin in Cape Town South Africa in 1918 following a practice that had been used intermittently in churches in town since 1916. Even from the beginning it was marked by noise – the firing of the noon day gun and ending with the playing of the bugle. The other observation was the underlying low level disorganisation. People were uncertain where to go, a lot of people couldn’t see well, the march got split into two sections by accident, people were jostling to get a good position and there were clearly moments of uncertainty even amongst the civic party. The periphery of the crowd was also threaded through with individuals who weren’t taking part, trying to work their way through the crowded pavement, cars stopped by the police and children crying. It was a healthy reminder that although when we think of ceremony and ritual in the abstract we tend to envisage a clearly shared script, informed participants and a impeccable organisation. In fact, even with a militarily organised, important high-profile event such as this, there were still ragged edges, awkward moments and confusion.